The mid-18th century marks the beginning of the modern science of coral reef biology, and one of the first great researchers from this era was a young Swedish naturalist by the name of Peter Forsskål. As a student of Linnaeus—the father of zoological taxonomy—Forsskål was in a unique position to contribute to the naming of species. 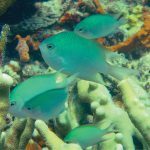 Many reef fishes familiar to aquarists were first scientifically described in his Descriptiones Animalium, published in 1775; however, the origins for many of his names are still quite poorly known. 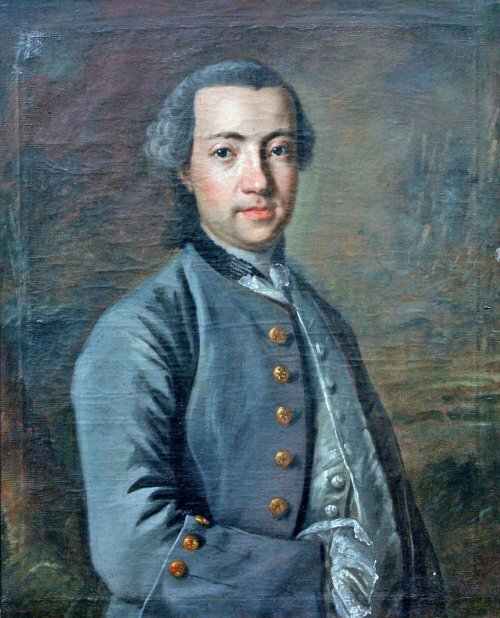 Forsskål was born in 1732 in Helsinki (then part of Sweden) to a clergyman and, at just ten years of age, enrolled at the University of Uppsala, where he studied under Linnaeus. He would eventually earn a degree in theology and, in 1756, a doctorate in Oriental language and philosophy. His interest then turned to economics, publishing in 1759 a controversial pamphlet arguing for freedom of the press, which earned him censorship and a formal condemnation from the Swedish government. In 1760, at the behest of Linnaeus, Forsskål joined a Dutch expedition to the little-known lands of Arabia. A primary goal of this mission was to better understand the region’s plants, as these are often mentioned in the Bible but were poorly known at the time, and thus much of Forsskål’s study was devoted to botany. But along the way he also acquired a great many fishes from the Red Sea, becoming the first to document and describe the ichthyofauna from these waters. After a year spent in Egypt, he and his colleagues traveled to Yemen, and it was here that things quickly took a tragic turn. One by one, the members of the expedition fell ill and died to malaria, with Forsskål perishing in July of 1763 at just 31 years old. The only survivor of this trip was mathematician and cartographer Carsten Niebuhr, who took upon himself the task of shipping the various specimens collected, as well as posthumously publishing Forsskål’s notes. Unfortunately, many of these specimens were either lost or deteriorated, and relatively few survive into the present day. As a student of Linnaeus, Forsskål was well-versed in the conventions of nomenclature, and his species were given names derived from the traditional Latin and Greek. 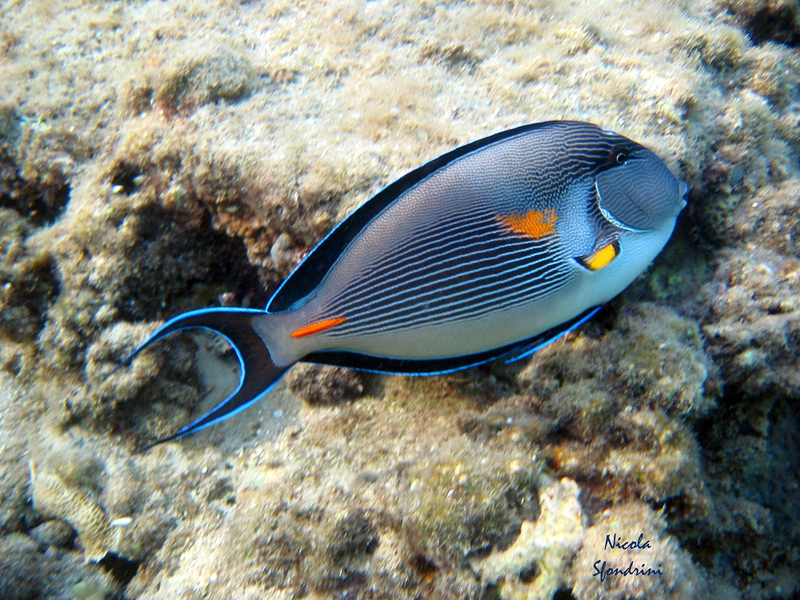 The surgeonfish genus Acanthurus (from the Greek for “spined tail”) is a particularly familiar example. However, Forsskål’s untimely death in Yemen prevented him from completing his work, and thus many of his fishes were never given their proper binomial. As Niebuhr labored to publish these unfinished field notes, he made a taxonomic decision which no doubt would have irked his deceased colleague. Instead of crafting a scientific name in the proper languages of zoology, he instead chose to directly transliterate the local Arabic names which Forsskål had dutifully recorded. These names were never intended to be used in this way, and, today, their origins are often obscure or unknown, at least to researchers not fluent in 18th-century Arabic. 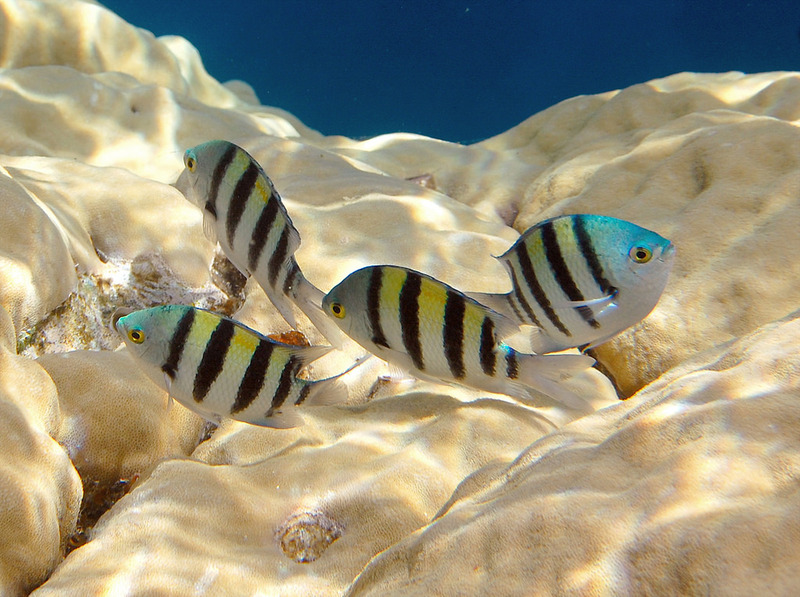 A particularly awkward example can be seen with the damselfishes of the genus Abudefduf, whose bizarre name is said to derive from “abu daffdouf” (أبو دفدف), which can loosely be translated as meaning “the fish with mixed sides”, presumably in reference to the prominent stripes. And then there’s the Siganus rabbitfishes, whose name come from the Arabic “sajjan” (سجان) and translates as “jailer or warden”, though it’s not clear what the allusion is here. 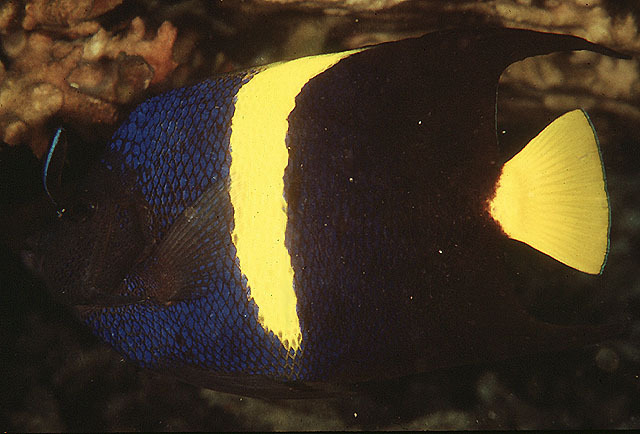 One of the more easily decipherable of these Arabic fishes is Acanthurus sohal, the Sohal Surgeonfish, whose name comes from “sohal” (سحل), meaning “to file or pare”, clearly in reference to the caudal spine of this fish. The Asfur Angelfish (Pomacanthus asfur is another interesting example. So what exactly is an asfur? For pooping, silly… but it’s also derived from the Arabic “esfwr” (عصفور), the name for a bird, perhaps in reference to the large fins and bright colors of this fish? Among the more intriguing names is that of the Longfin Batfish (Platax tiera), whose epithet comes from the Arabic “tira” (طيرة), meaning “rash, careless, frivolous”, but also “a bad omen or evil portent”. So, which is it? 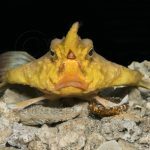 Is the batfish a carefree louche or some sort of menacing augur? The Sammara Squirrelfish (Neoniphon sammara) is a beautiful species with a particularly poetic Arabic name, “samara” (سمارة), which translates as “soft light”, possibly in reference to the muted colors of this fish, which evoke the gentle hues of a crepuscular sun upon the waters of the Red Sea. 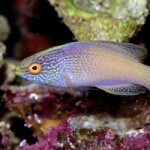 In total, Forsskal named 151 new species of fish, though many of these are now either synonymized or otherwise unused. 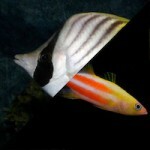 Those that aquarists are most likely to be familiar with include the Assasi Triggerfish (Rhinecanthus assasi), the Threadfin Butterflyfish (Chaetodon auriga) and White-face Butterflyfish (C. mesoleucos), the Lyretail Grouper (Variola louti), the Yellowbar Angelfish (Pomacanthus maculosus), the Coral Hind (Cephalopholis miniata), and the Lavender Surgeonfish (Acanthurus nigrofuscus). And who knows how many others Forsskål might have gotten around to had he not been taken by malaria at such a young age. 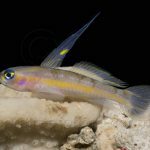 Yet, for all his importance to the early study of coral reef biodiversity, only a single species of fish is named in his honor—the Red Sea Goatfish (Parupeneus forsskali).